I’m in the attic space at the Lawrence Batley Theatre in Huddersfield, snapping away during this morning’s rehearsals for The Ruck which premieres on Friday. 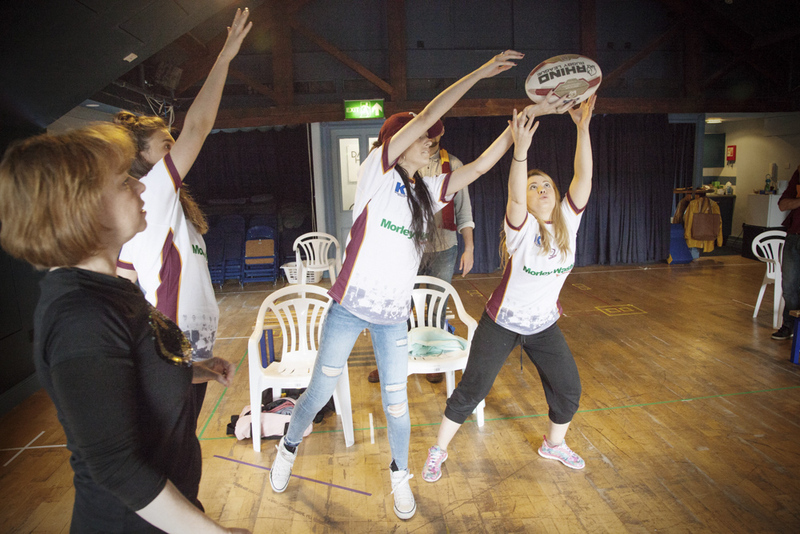 Written by Kevin Fegan and commissioned by Creative Scene, it’s a play about the Batley Bulldogs Girls’ Under 16s team tour to Australia, the first ever tour by a girls’ rugby league team. I’ve been following the evolution of this play on this blog since the girls and their families flew out from Manchester Airport in November 2015. I can’t wait to see how their adventures translate onto this stage this Friday. 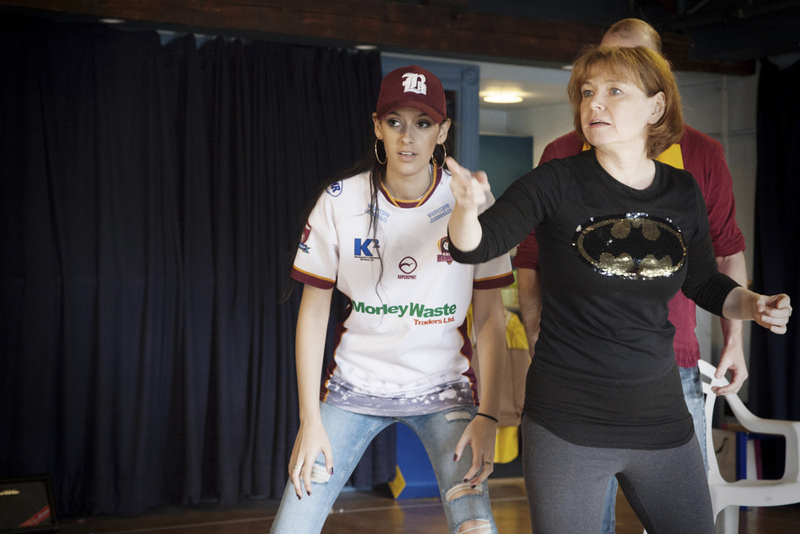 Director Joyce Branagh and the eight-strong cast are having a good laugh trying to work out a passing sequence where the Batley Girls triumph down under for the first time. “What if I run round this way?” asks one of the girls. This whole time the assistant director is recording new stage directions and cues on her copy of the script. Creative Scene stalwart Rebecca Foster – who runs the West Yorkshire Drama Academy – has been invited to work with, and learn from, Joyce. “Her direction is so imaginative and creative,” Rebecca tells me at the tea break. 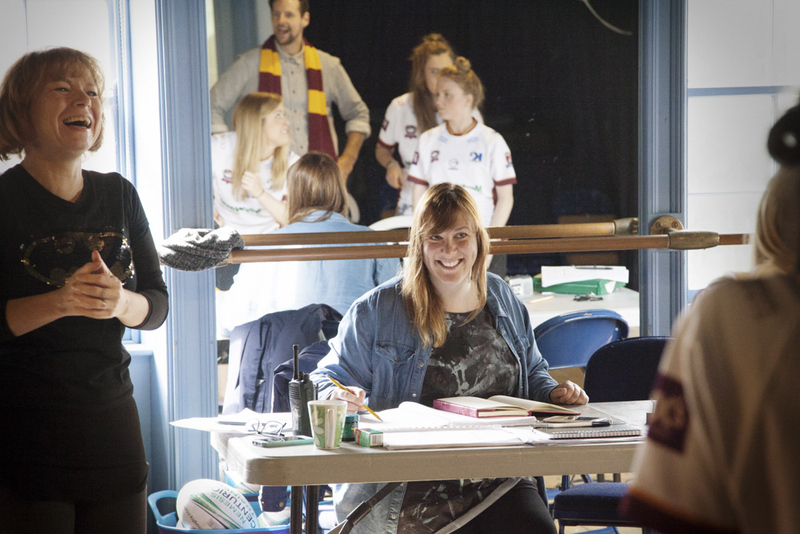 “As a young director I wouldn’t know where to begin in staging rugby match sequences with just four actors, but Joyce does this fantastic job of making it exciting and fun to watch. “As you’ve seen she creates an environment where all the cast contribute their own ideas. It becomes a real collaboration and there’s an amazing team spirit in rehearsals. While Rebecca gets a cuppa, I turn my recorder on Joyce. “How important is a woman director for this play?” I ask. 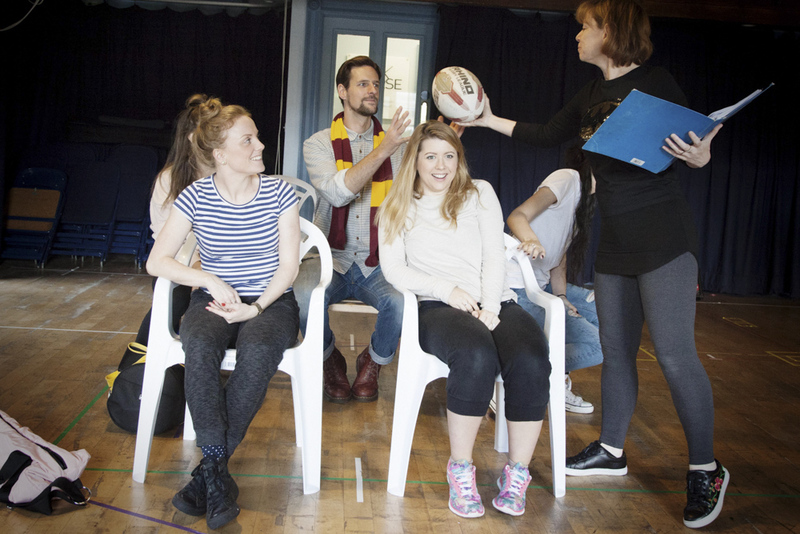 “As someone who continually bangs on about there not being enough good parts for women in theatre I was very excited to get this role as a female director but, you know, I think it would be fine to have a male director too. “And, apart from the ball rolling to the back of the stage after an incomplete pass, what would you say has been your biggest challenge?” I ask. 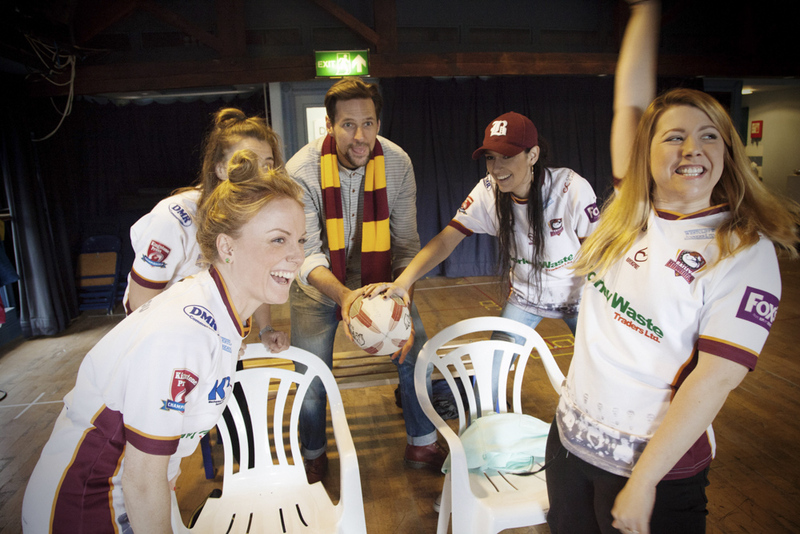 Before the mugs are back in the sink I ask actor Josie Cerise about their trip to the Mount Pleasant Stadium when some of the Batley Girls gave the cast a spot of coaching during a publicity photoshoot. “We threw the ball around with them,” recalls Josie. “I like to think we picked it up quite quickly. We just have to look as if we know what we’re doing! The Ruck is at Lawrence Batley Theatre this Friday and Saturday (tickets here) and then tours from the 18-22 September to the Theatre Royal Wakefield, Cast in Doncaster and finally The Civic, Barnsley.